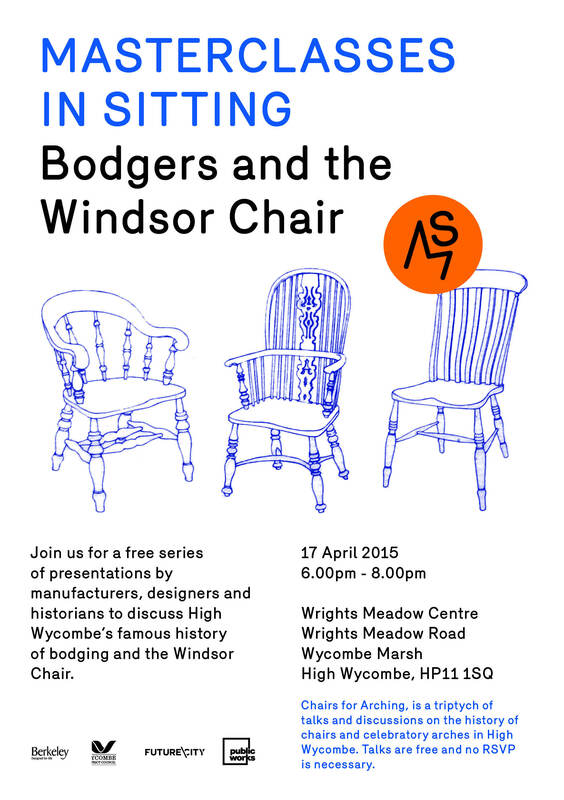 RFS members are invited to attend a free series of presentations by manufacturers, designers and historians to discuss High Wycombe’s famous history of bodging and the Windsor Chair. Masterclasses in Sitting is a commission for the new Wye Dene development in High Wycombe. Taking as the starting point High Wycombe’s rich history as the centre for furniture production, public works proposes a project which uses ‘sitting’ as a way of relating. Connecting the new Wye Dene estate with High Wycombe, its past and future. The talks will take place on 17th April 2015, 6pm at the Wrights Meadow Centre, Wrights Meadow Road Wycombe Marsh, High Wycombe, HP11 1SQ . No RSVP is needed, the event is free. Dr Bernard ‘Bill’ Cotton is a furniture historian who has pioneered the study of vernacular furniture in both the UK and in Countries where the British settled. He has travelled widely, often with his wife Gerry, to record the regional traditions of furniture made for the homes of working people , over a forty year period. His extensive archive is a major resource of design and social history information and his collection of some four hundred English regional chairs is now gifted to the Geffrye museum. His published work includes ‘The English Regional Chair’ (ACC. 1990 ). More recently he has completed his major work ‘Scottish Vernacular Furniture’ (Thames and Hudson. 2008 ) which for the first time identifies the chair and other furniture designs made there. He was co founder, with Christopher Gilbert, of the Regional Furniture Society and is presently the society’s Emeritus President. Jake Kaner is professor in furniture at Bucks New University. He has been involved with documenting the furniture industry through the curation of the High Wycombe Furniture Archive. Funding awarded form the arts and humanities research council supported the digitisation project which captured 16,000 images and text from the archive. The material covers the High Wycombe manufacturers, Ercol, Gomme (G-Plan) and Skull. The website that disseminates the material has been highly successful receiving an average of 100,000 hits per month since its launch in 2009. Currently Jake is working to digitise the William Birch archive in partnership with the Wycombe Museum. This material illustrates design books for art furniture that was made for Liberty’s of London between 1890 and 1910. A further project involving the designs of Ib Kofod-Larsen, a Danish designer who worked for G-Plan in the 1960s, involves creating computer based models of furniture that was never put into production. Jake is also a trustee for Wycombe Heritage and Arts Trust.